If your existing customer satisfaction surveys don’t take customer loyalty into account, you’re likely missing a valuable component. You see, a survey should measure more than just satisfaction. It should also gauge the loyalty of your existing customers. In that way, you’ll position yourself to get ahead of the competition, with information that will help drive your sales cycle, convey brand authority, and allow your entire team to exceed expectations. The decision of when to conduct a survey is critical to success. 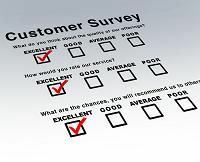 The best time to deliver a customer satisfaction survey is immediately after an interaction with your business, such as a sale, because that experience is at the top of your customers’ minds. How often you send out a survey is generally dictated by your industry and products/services. Looking at frequency from the customer’s viewpoint also helps. If you send a survey out too often, it’s likely to be tossed in the trash. If your communication cycle is too long it might prevent you from eliciting the information you need. To get the most benefit and best response rate, you do need to be consistent and have a systematic approach to sending your customer satisfaction survey out to all customers at your pre-determined, post-transaction timing. No survey should forgo asking for a referral, one of the best ways to gauge customer loyalty. If they are willing to tell family and friends about your products and services, you can put another notch on your sales belt. It’s ideal to include two questions here: One that allows customers to answer “yes” and “no,” and one that asks for contact information. How effective are your customer satisfaction surveys? Contact Continuity Programs, and find out how we get proven results for businesses across more than 20 industries. At Continuity Programs we work hard to provide companies with corporate branded personalized marketing programs that are virtually hands-free.